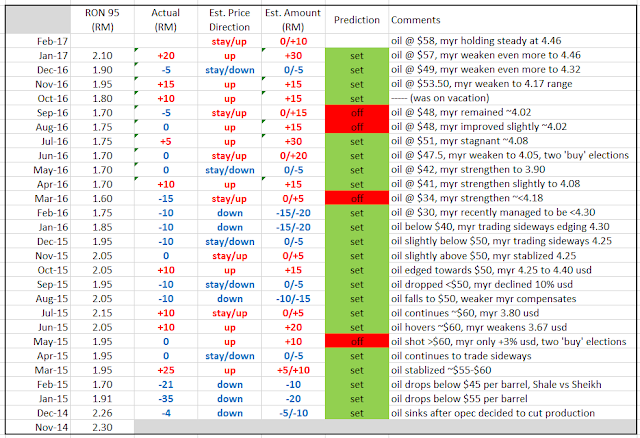 Oil prices have been falling slightly since the New Year. After a bullish announcement from the Organization of Petroleum Exporting Countries and production cuts by non-OPEC nations, the narrative has become bearish, focused on drilling for U.S. shale oil, as well as the failure of some nations to observe calls to cut output. However fundamentals are being unduly influenced by concerns about higher rig counts and the lack of compliance by OPEC oil production cut compliance. Price seems to be holding at this range $50 to $60 but there could be upside during 2017 U.S. summer driving season; late May to early September. A somber month for the Malaysian Ringgit. BNM maintains its policy rate unchanged at 3.00% in January. The decision to hold the Overnight Policy Rate unchanged suggests that the Central Bank is more worried about supporting the ringgit than boosting Malaysia’s sluggish economy. The ringgit is Asia’s worst-performing currency since Trump’s surprising victory in the U.S. presidential elections—it has fallen more than 5% since then. 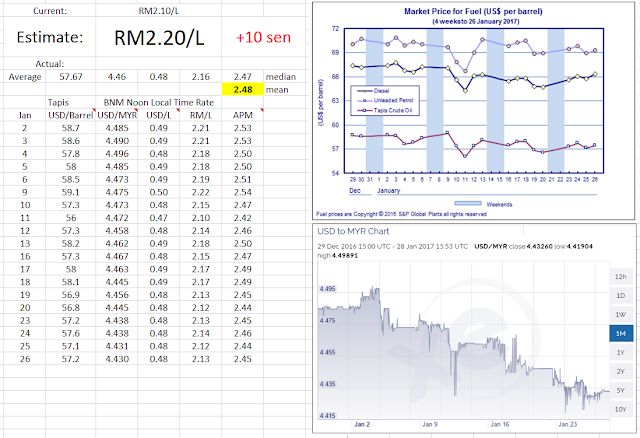 MYR maintained its weakness and is unchanged (@ 4.46). 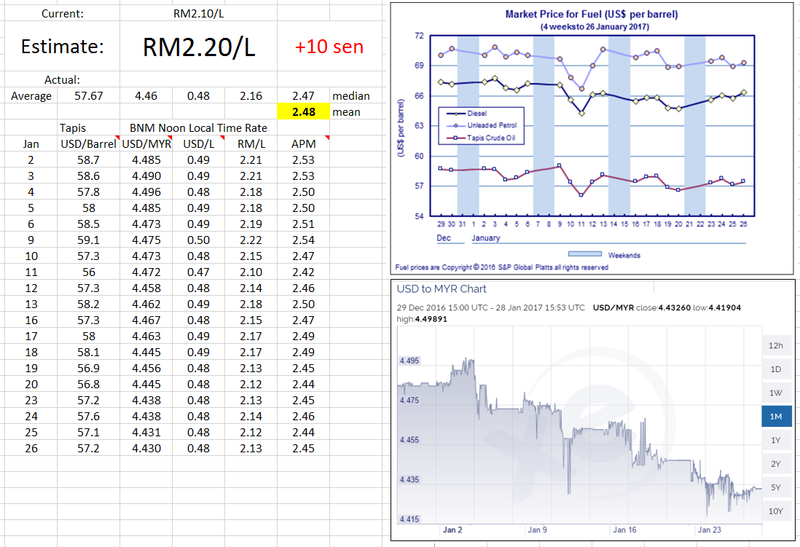 However this is overshadowed by global oil price which on average went up by $1 ($56.69 to $ 57.67) hence the RM/L between December and January actually weaken: 2.12 vs 2.16. 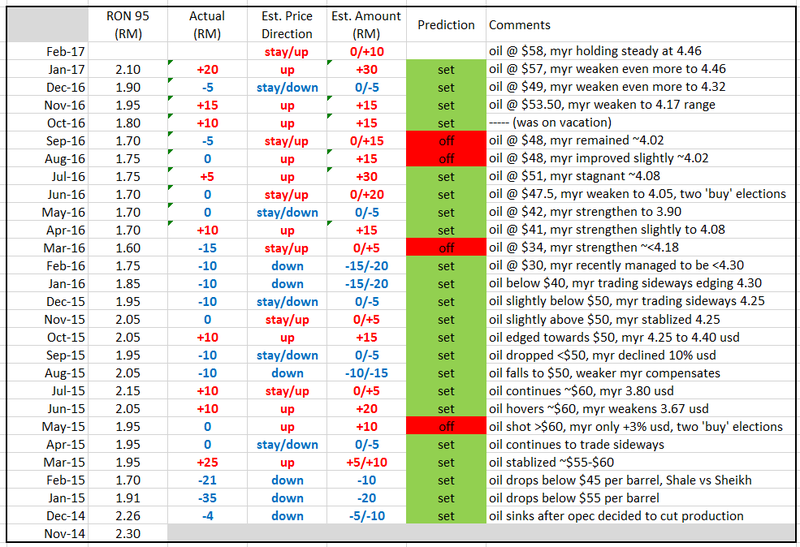 This round I am forecasting either current prices to stay or it may go up to 10 sen (RM2.20) for RON 95. Since it is Chinese New Year if you have the chance go and fill it up as early as possible to be on the safe side.